Home & Office Window Cleaners Essex IG | Quality Property Care Ltd. 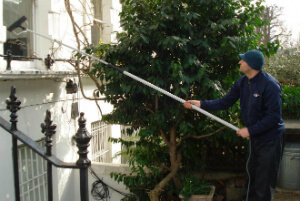 Enjoy more than simply qualified window cleanup, give Quality Property Care Ltd. a phone call and reserve the best window cleaning in Essex IG at a reasonable rate. Fully capable and equipped, we will leave no spots behind, eliminating not only grease, but built up mud, grime, dirt, fine powder, mud, rain residue, fingerprints and a lot more. Along with your professional windows cleaning, you can also reserve one or more other maintenance services and outdoor cleaning. By reserving more than one service provided by the company you will save a lot of money and time, and will receive a total cleaning service at the same time. You can purchase professional driveway jet washing, gutter cleaning, patio, outside and inside conservatory window cleaning, gardening and others. Certainly, for a full cleaning, you can order curtain cleaning and indoor windowns cleaning too. Indoor cleaning is done manually with squeegees, efficient and safe windows cleaning method.So, you can get a perfect window and gutter cleaning, or only windows cleaning by booking the reliable and high-quality cleaning services of the company. Dear customers, Quality Property Care Ltd. company fully assure you that your home is under safety. The staff we send to you is composed of insured and well-trained window cleaners. They are devoted, motivated and diligent. You are not even obliged to stay in the house in the course of window cleaning in Essex IG. All you need to do is to leave us some parking space, so the helpful experts can park the van with the water fed pole product. In case of any omission, we handle the damages or re-do the procedure for free! Your final customer satisfaction is confirmed. This service plan is not hourly based, meaning that you book us per window, we leave once you are pleased. Routine maintenance on all of the windows to be cleaned have to be completed in order for us to effectively clean the glass, seals and frames. A minimum callout fee of 35GBP does apply, but, if you book us in advance you will receive a reduced cost. You can get in touch with us for a same-day cleaning, during weekends and bank holidays at no additional fee. For us to be capable to clean effectively there must be a crystal clear access to the windows and a parking space within 30 meters on the same side of the property as the glass windows. We are not able to clean wooden window frames and sills with our water-fed system, or we might harm the paint and glass. We work for offices, restaurants, residential homes, shops, property managers, landlords and tenants, public buildings, libraries and a range of other customers. We are also offering you an interior window cleaning job which can be merge reserved with the outside window cleaning service. 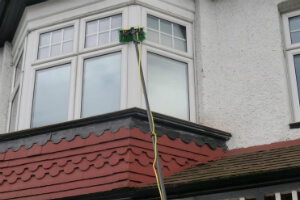 At a lower price tag you can book both and find your office or home windows cleaned along with your gutters and conservatory roof and windows. To properly clean inside we use a professional grade squeegee, protective gloves, a ladder, a bucket and a special detergent mixture. The detergent is applied then left to react with any dusty or greasy stains on the inside of the window. After that it is scraped away with the squeegee leaving your windows spotless. For the cleaning Quality Property Care Ltd. specialists use plain water from the tap, it passes through a series of filters located inside the van, they strip the h2o from its miners and other chemical compounds, leaving it pure. This natural water does not react with the dirt on your window but strips it away gently and without damaging neither the glass nor the sill or frames. It is suitable for the leaning of all window kinds, it does not leave a chaos aside from a puddle and it is aroma free. Just get in touch with 020 3746 4287 or send an online booking request, and our customer care service will be back to you ASAP. You will receive written verification for the booking. There is no deposit necessary, and you will pay only after the service has been completed. The costs options accepted are flexible. No covered charges, and big discounts for returning customers or for those purchasing more than one service at a time.